The most shocking thing about Solace isn’t the fact that it’s attracted a couple of high-profile actors to the script, nor that this is the English language debut of Brazillian filmmaker Afonso Poyart, nor even that it’s been over two years since it started shooting and has been sitting on the shelf up until now. No, the most shocking thing about the entire film is that – and we’re seriously not making this up – it was originally intended to be a sequel to Se7en. Yes, THAT Se7en – the one where Brad Pitt asks Kevin Spacey what’s in the box, the very same. And boy, when you hear what this film is about, you’ll be just as taken aback as we are. Anthony Hopkins is a psychic – still with us? – who is recruited by his old buddy Jeffrey Dean Morgan and partner Abbie Cornish to help them figure out the path of a serial killer – no, wait, it gets better. He does this by touching items around the victim, or sometimes even the victims themselves – please, hear us out – and gets a few glimpses of the killer’s pattern as well as the murderer himself, who turns out to be the second-biggest name on the cast list (Colin Farrell), but also happens to be a psychic – sit back down! – and a much more powerful one at that, being able to see pretty damn accurately into the future. Did you manage to make it through all that? If you did, then you can deduce very quickly that this is most certainly a barmy and completely silly premise – and certainly not the style David Fincher’s dark thriller was aiming for. We have no idea which of the two credited writers was the one to originally have it as a follow-up to that film, but we can only guess it must have come from the mind of someone writing their most treasured piece of fan-fiction. Honestly, can you imagine what it would be like if they really did make it a direct sequel? The idea of Morgan Freeman, having watched the infamously bleak ending of Se7en pan out, suddenly developing out of nowhere some pretty damn powerful psychic abilities and using them to solve crimes… is actually pretty awesome, but it would still be extremely stupid, and most certainly not keeping with the realistic and dour tone. It’s like putting a TARDIS in the middle of a scene from The Godfather; the obvious fantasy element immediately takes you out of the grittiness. Thankfully, it didn’t end up following on from that film; but even on its own, it’s still completely ludicrous. The film expects us to buy early on that clairvoyants just sort of exist in this world, and they’re best used as mere devices by law enforcements to conjure up some creepy abstract images in order to catch killers of all sorts. Even in a film where Anthony Hopkins is aiding the FBI and ISN’T a known cannibal, that’s a lot to buy. Hopkins, by the way, has a little bit of fun with the material, but not as much as Colin Farrell who, despite not showing up until roughly an hour in, makes the absolute most of hamming it up like mad as the deranged killer that rarely seems to blink at all in his first major scene. If he hadn’t already appeared in True Detective earlier this year, it would be the most entertainingly bad performance he’s done all year. Everyone else, from a bored-looking Abbie Cornish to a grey-bearded Jeffrey Dean Morgan, barely registers. The fact that it also uses a good chunk of crime clichés – the retired veteran brought back into the game, a major connection between the hero and the villain, and many others – are the least of its problems. The whole thing is just a silly, ridiculous mess that not even the suspension of disbelief can solve; but the biggest problem of all is the fact that, at one point in its development, someone was seriously considering this to be a direct sequel to Se7en. 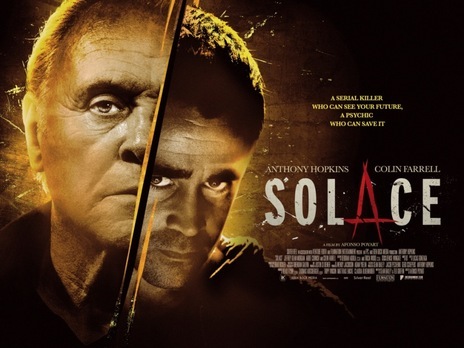 If things had gone their way, it would have been the biggest “jumping the shark” idea ever for a follow-up to an otherwise great film; but on its own, Solace is just too silly to be taken seriously. Solace is an extremely silly thriller that baffles with its far-fetched plot and performances by its hammy actors, but the fact that something this barmy was almost a direct sequel to Se7en is simply mind-boggling.